DIE Mercurii, 28 die Novembris. Sir W. Parkhurst, Warden of the Mint, Petition against Coinage Bill. Message to H. C. for a Conference about Committees of both Houses examining Public Accompts. Epus. Serum. Ds. Custos Privati Sigilli. 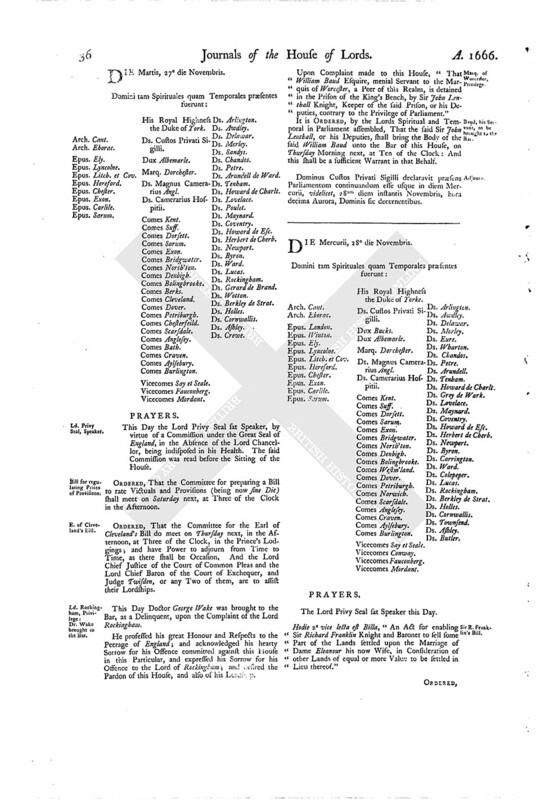 Hodie 2a vice lecta est Billa, "An Act for enabling Sir Richard Franklin Knight and Baronet to sell some Part of the Lands settled upon the Marriage of Dame Eleanour his now Wife, in Consideration of other Lands of equal or more Value to be settled in Lieu thereof." Their Lordships, or any Five; to meet on Monday next, at Three of the Clock in the Afternoon, in the Prince's Lodgings. ORDERED, That the Lord Wharton, the Lord Holles, and the Lord Butler, are added to the Committee for the Bill for encouraging of Coinage. ORDERED, That the Lord Eure and the Lord Chandos are added to the Sub-committee for the Journal Book. ORDERED, That the Lord Great Chamberlain is added to the Committee for the Earl of Cleveland's Bill, and the Bill for encouraging of Coinage. ORDERED, That the Committee for the Bill to confirm Decrees made in Courts of Equity concerning Enclosures shall meet on Tuesday next, at Three of the Clock. Hodie 1a vice lecta est Billa, "An Act to enable Leycester Grosevenour to sell Lands, for Payment of Debts." Hodie 2a vice lecta est Billa, "An Act for uniting of Churches, and raising of Maintenance for Ministers, in the Town of Southampton." Their Lordships, or any Five; to meet on Tuesday next, in the Prince's Lodgings, at Three of the Clock in the Afternoon. Upon reading the humble Petition of Sir William Parkhurst Knight, Warden of His Majesty's Mint; praying, "That a Clause in the Bill for Encouragement of Coinage, whereby he conceives himself to be prejudiced in his said Office, may be altered:"
It is ORDERED, by the Lords Spiritual and Temporal in Parliament assembled, That the said Petition be referred to the Consideration of the Lords Committees to whom the said Bill stands committed. 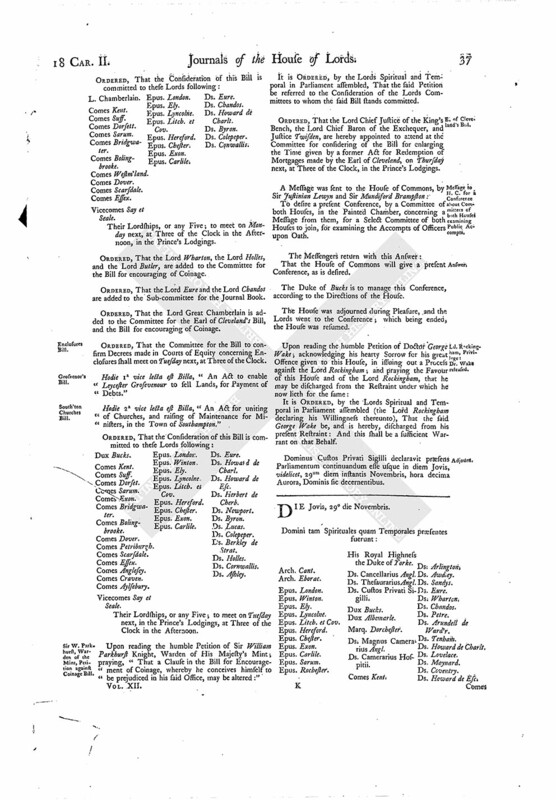 ORDERED, That the Lord Chief Justice of the King's Bench, the Lord Chief Baron of the Exchequer, and Justice Twisden, are hereby appointed to attend at the Committee for considering of the Bill for enlarging the Time given by a former Act for Redemption of Mortgages made by the Earl of Cleveland, on Thursday next, at Three of the Clock, in the Prince's Lodgings. To desire a present Conference, by a Committee of both Houses, in the Painted Chamber, concerning a Message from them, for a Select Committee of both Houses to join, for examining the Accompts of Officers upon Oath. The Duke of Bucks is to manage this Conference, according to the Directions of the House. Dominus Custos Privati Sigilli declaravit præsens Parliamentum continuandum esse usque in diem Jovis, videlicet, 29um diem instantis Novembris, hora decima Aurora, Dominis sic decernentibus.